Seeded bagels. Photo credit: the freshloaf.com. Making bagels. Photo credit: antarcticsun.com. 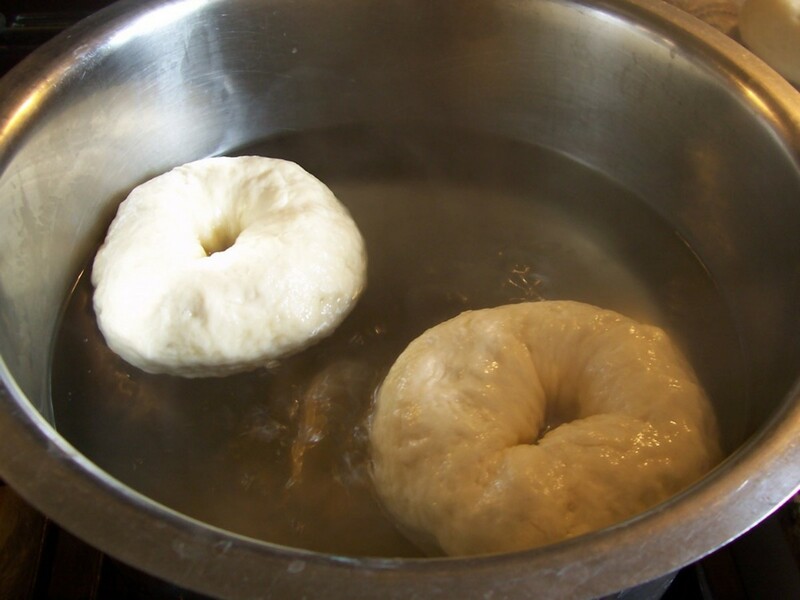 Bagels being boiled in water. Photo credit: madteaparty.com. I've made a lot of bagels in my time. I owned a bagel restaurant for years, and you would find me every bleary-eyed morning kneading the dough and hand rolling all the fresh bagels for the day. I've since gotten out of the bagel game (yay, sleep!) but I still love a great bagel. People think that making outstanding bagels at home is really difficult, but it's really no harder than making a loaf of bread and can be done within about an hour. Don't be discouraged if your bagels look at bit funny at first, you'll get the hang of it in no time. Those curiously-shaped bagels will still beat supermarket bagels hands down. 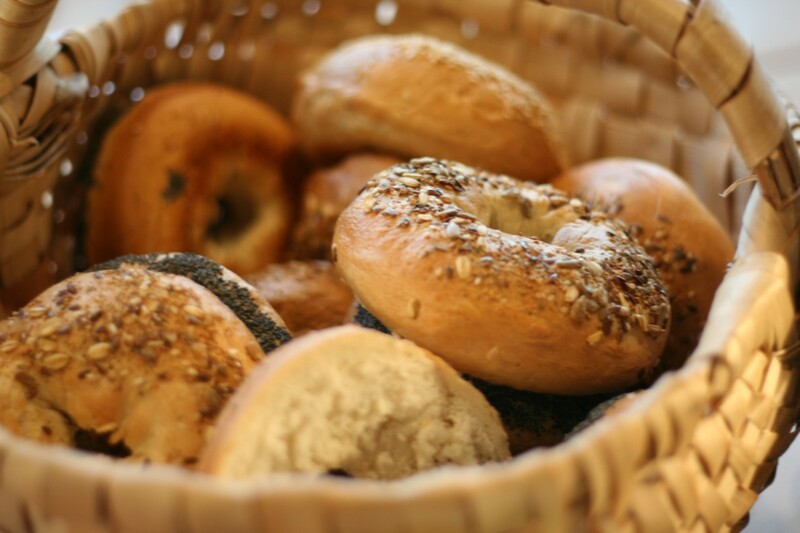 What makes a bagel different from other breads is the two-stage cooking process. 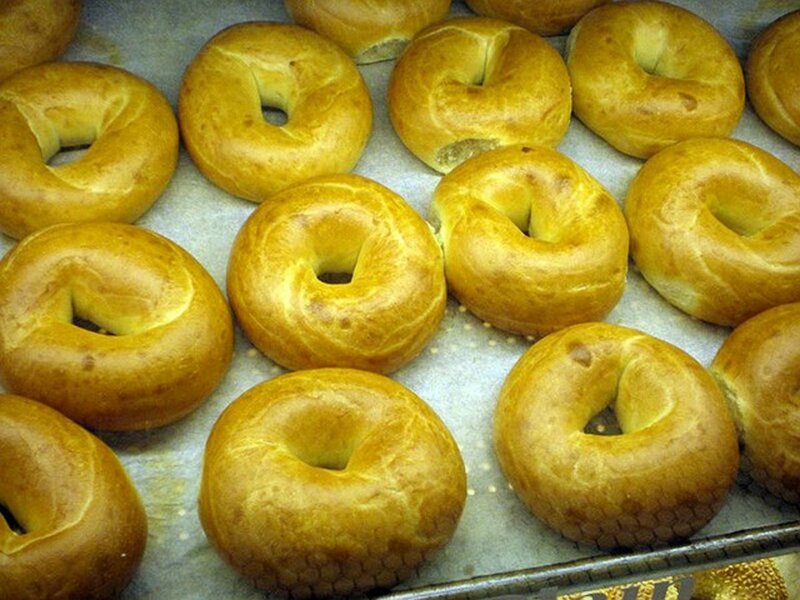 A bagel is first briefly boiled, and then baked. I worked the meat counter in a Jewish deli as a teenager, and as my boss would say, an unboiled bagel is just a roll with a hole! Mix all the ingredients in a bowl. You don't have to worry about soaking the yeast when you use instant yeast (most yeast sold these days is instant yeast). The dough should feel stiff, but add the extra water if it's really stiff, or you won't be able to get all the dry flour incorporated. Cut the dough into 8 equal sized balls, and let rest for 10 to 20 minutes. Now, take each of the dough balls, and using two hands, roll them into little snakes on the counter. When the snake is longer than the width of your two hands, wrap it around your dominant roiling hand. The dough rope should be wrapped so the overlapping ends are together at your palm, near the start of your fingers. Now take the two overlapping ends, and use your palm to squish and roll these two ends together. Once the dough is fused, you should have a perfectly circular bagel-to-be! This is the only part of the process that can take a little practice before your bagels will look really professional. Don't get discouraged if they don't look perfect, it just takes practice! Let your bagels rest on the counter for about 20 minutes. Meanwhile, bring a pot of water to boil, and grease a large baking tray lightly. You can just rub a splash of vegetable oil and rub it around. After the 20-minute wait, your bagels will start to look puffy, and it's time to get them boiling! Add them as many at a time as you can to your boiling water without crowding them. Boil for about a minute, turn them over, and boil for another minute. Take them out a let dry for a minute and then place them on your oiled baking tray. Repeat until all the bagels are boiled. Add the tray to the oven, and after 10 minutes, flip the bagels over, bake for another 10 minutes; and they're done! You can add any toppings you like to these. To make sesame, onion, poppy seed, caraway, etc. 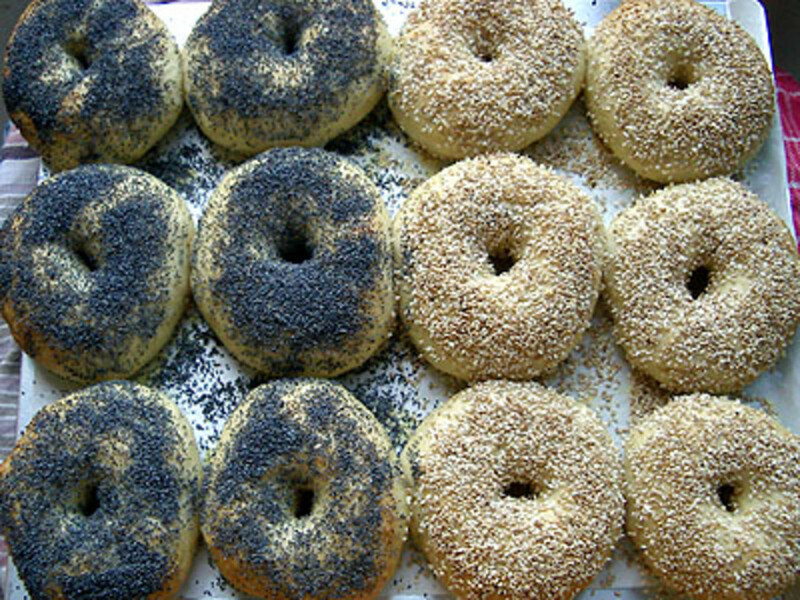 bagels, just have a dry plate ready with the seed or spice topping spread out on it. After the bagels have come out of the boiling water, place them face down onto the seeds, and then place the seed side up onto the baking tray. 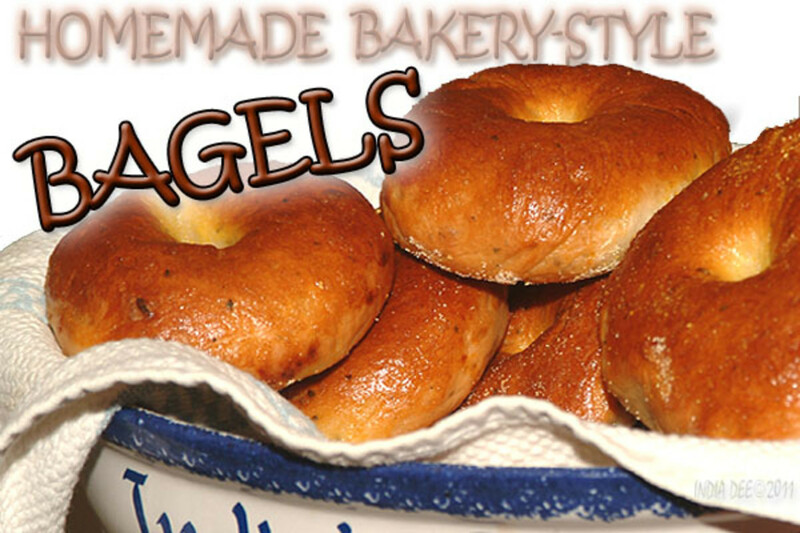 Bake and flip as for plain bagels. I found your recipe about 8 years ago.I was living in Germany and was missing a good bagel with schemer. I came across your recipe, tried it and loved it. They have been a hit in my home and at brunch potlucks a like ever since. So easy and delicious. Can a stand mixer be used to knead the dough, or is hand kneading a must? This was my second try at making bagels and the bagels turned out great!!! They should float. If they don't, your yeast probably isn't working and you aren't getting any/enough rise. These are so delicious, nice and soft on the outside with the smooth crisp finish on the outside. Third time making these in the last 3 weeks, can't keep them in the house for very long! 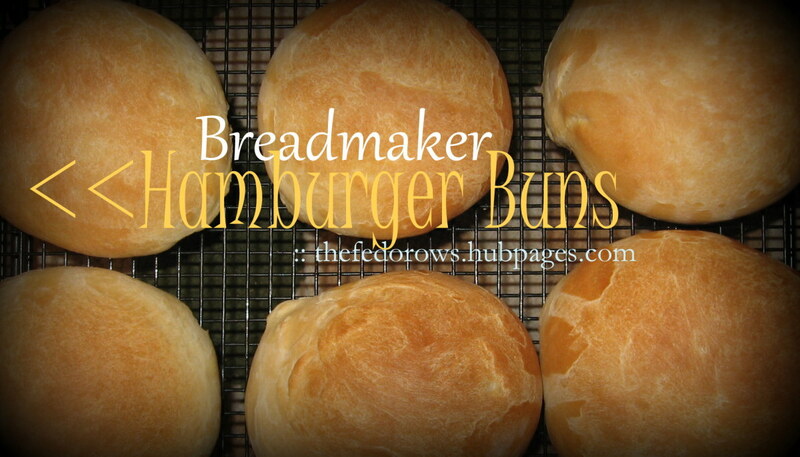 Terrie Michelle, I always use active dry yeast when I make this recipe. Just proof the yeast first, as you would for any bread recipe. Warm water (for this recipe, I find 1 1/3 cups of water is the way to go), the sugar, and the yeast. Let it sit till frothy, then add the rest of the ingredients and mix. I've never had a problem using active dry yeast. Hi, I will be making the bagels this weekend but I brought ActiveDry Yeast packets that states in it All natural yeast. It's not really rapid kind. Can I still use this according to your recipe? John, your recipe is fantastic, and I just wanted to say thanks for sharing your knowledge and experience. I've made bagels before with MUCH lesser results. I have been making your recipe almost every Sunday for the last two months or so, and not only are they fantastic (and freeze well!) but they are saving me a boatload of money on bagel-shop bagels with absolutely no difference in quality. Thanks! Oh these were delicious! I will be making them at least once a week from now on! 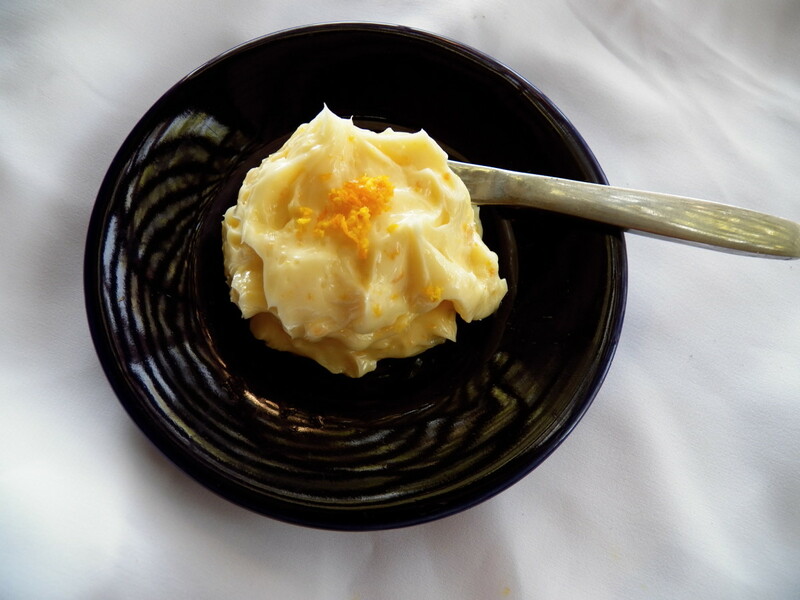 Would you mind if I shared your recipe on my blog, with credits and a link back to you of course. Should my bagels float when I boil them? And if they dont, what am I doing wrong???? We utilized to get at the top of lifestyle nevertheless lately We have accumulated a new level of resistance. Made these yesterday - they were awesome!!! Made 6 instead of 8. Making them again this morning. Making 8 this time. If I were to make 10 smaller bagels (good for little kids) would it change the resting/rising/boiling/baking times? These are amazing!! Thanks so much for sharing!!! This was my first attempt at making homemade bagels. I am so glad I used this recipe! I added 2 teaspoons of vital wheat gluten since I didn't have bread flour and I added about 1/2 TBS of molasses to the boiling water. It was easy, faster than any other real bagel recipe I've seen, and most importantly, fabulously delicious! I made the recipe exactly as directed and voilà! Bagels are in the house in Paraguay! 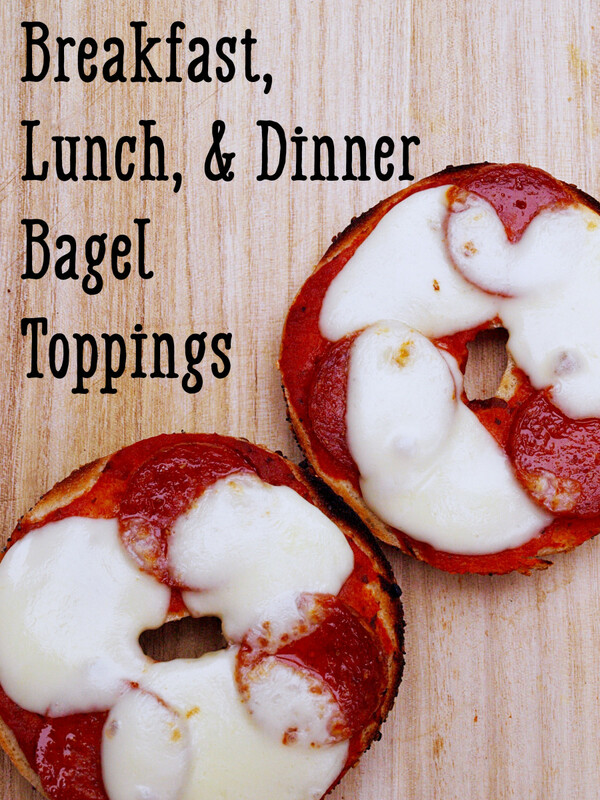 This was ridiculously simple, and now I know that wherever I am, I'll never be bagel-less again! Thanks for the recipe! What if I wanted to make pumpkin spice bagels? How would I alter the recipe? I got here through a friend who posted some amazing results from her first try on her Facebook page! I'm living in Paraguay and desperate for a good bagel... so I'll definitely give these a try. Flour down here in South America is generally classified with 0, 00, 000, or 0000 and after some research I've determined that 000 should be used for bread products due to gluten content - so I'll give it a try and let you know how it goes! What a great recipe! I actually found this a couple of years ago and made it several times. At the time, I was only baking for my husband and me, so this made much more than we needed, but I would toss the extras in the freezer and defrost them in the microwave for breakfast throughout the week. I haven't made them in a while (since my daughter was born) but sometimes I fantasize about it -- maybe I will try it again soon. If you get a small bowl of cold water and put a bagel in it during the proofing process, you will know if it is ready to boil. If the bagel floats within 10 seconds, it is ready to boil. If it doesn't, then let it proof a few minutes longer. In hot weather this will be just a few minutes, in cold weather it will take longer. Would I change anything if I used Rapid Rise yeast? I have made this recipe dozens of times, well worth the effort and fairly quick once you get the hang of it. I actually read through every single comment on here last night in anticipation of this mornings baking to see if anyone had any handy hints. Mine sometimes come out flat and hard other times tall and light. Inconsistancy is annoying, I think it has to do with the yeast and the temperature fluctuations we have here in southern NZ. But after reading the comments I felt brave enough to try some new ideas, so used 2 cups high grade flour, 1 cup all purpose and 1 cup buckwheat flour (just becuase I had some to use up). I also substitued the sugar for honey and added baking soda and treacle to the water. They came out good, I wouldn't say perfect but I'm going to keep trying for perfect by changing things around a little. I don't think the baking soda or treacle in the water made much difference, but I highly recommend making the bagel shape by making a ball and pushing your thumb through the middle to make the hole, way easier than trying to join the ends. Thanks for the recipe others I tried wer a complete disaster. I've been a bagel fan for well-over 15 years. I prefer them over doughnuts in the morning. Wow!!! Thanks for sharing the recipe!! I always thought that bagels were too difficult for the average person to make! LOL this was easier than making an apple pie!!! My family loved them and I will deffinately be making them again!!! Thank you! Thank you! Thank you!!! I just made my first batch of bagels today! They are awesome!! Thank you so very much for posting this!! GREAT RECIPE!!! I learned to make bagels a few months ago. I have been through many recipes. This is by far the best! It is so easy and tastes great! I've made bagels that takes hours and even one that took a whole day. You are amazing! I'm going to try your recipe tommorow. Few years back I tried making bagels once, but they didn't came out right. I hope this time I'll get better luck. Loved the bagels they came out great and tasted even better. My kids loved them made some turkey sandwiched with them best bagels I have ever had. I had a jalapeno bagel craving and was the only one at home so I made 1/4 batch - stupid right? I have made bagels before and couldn't be bothered looking for the recipe but knew not to let them double or get to puffy before boiling. I only had home brand flour and they were still great. I hadn't flipped my bagels before, next time I will flip only sime to see the difference. I spray the oven with water upon putting them in to get a crisp crust. I have tried putting the malt syrup in the mix previously as another reviewer asked but they came out stodgy. When I added it to the boiling water it added a nicer colour and flavor than these. I've never seen dried blueberries here. Has anyone tried making them with fresh berries? whomever said that the bagel tasted like a pretzel.. Umm duhh pretty much similar stuff.. I just want to add my thanks to the hundreds you have received on this site. I'm originally from New York, lived in Miami and now live in Vancouver, Canada, While Vancouver is one of the most beautiful places in the world to live, great bagels are impossible to find. ( I can't understand why, because Toronto's bagels are as good as New York') Anyway, I've been planning to make these bagels for months and finally found the time. Made the dough in my Breadman, on dough cycle ...but removed the dough before it rested. Then cut the dough into 8 pieces, followed your instructions and "Bob's your uncle". OMG, I will never buy bagels in Vancouver again. Now if I can only find a way to import New York water to Vancouver (for the bagels) life would be sweet. Thank you , Thank you! 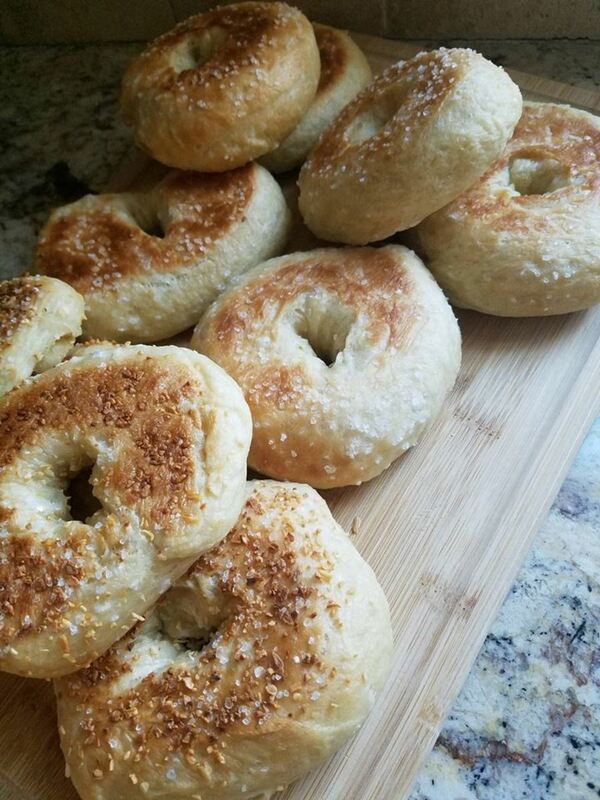 I made bagels for the first time using this recipe and they turned out fabulous!! I made one slight addition, as I brushed the tops of the bagels with a tiny bit of canola oil which made the bagels brown very nicely. Looks great all. 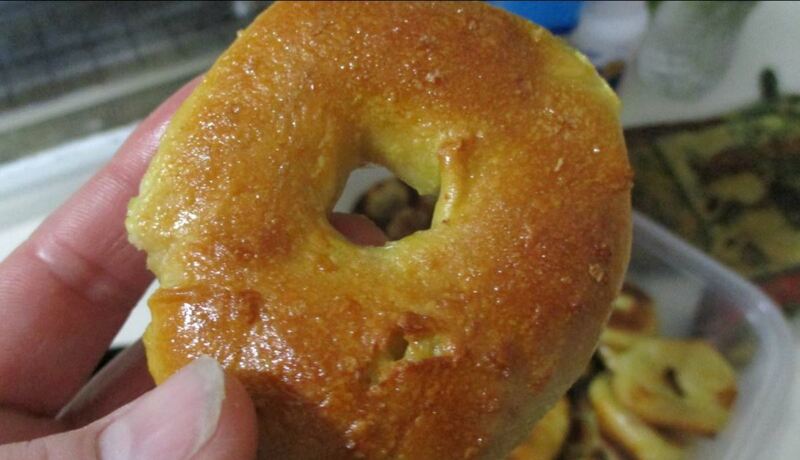 I feel hungry.Homemade bagel recipe is fantastic. It took me three tries to get this right (first time entirely my fault...not sure what happened the second), but it was COMPLETLEY worth it. Bagels here are disappointing, at best, and it's so wonderful to be able to have the real tasty thing. thanks !!! This was such an easy & wonderful recipe thanks! My effort involved replacing 1C of bread flour with 1C wheat flour and 1t gluten all King Arthur brand. Turned out awesome. Easiest dough I've ever worked with! So fun!!! Just followed the recipe and made homemade bagels for the first time ever. They came out perfect! Can't believe how great these taste. Thank you for the post. I have to tell you-- I recently moved to Germany, where there are few bagels and if you find them, they are NEVER boiled, not even steamed. I grew up eating bagels on the weekends from a local Jewish bakery and I was so homesick, first try they were alright, but I have a feeling they'll get better with practice and 1050-high gluten flour! Thank you for posting your recipe. I have been making them now for about a year and have added all types of ingredients into them. Sun Dried tomatoes and Basil is one of my most asked for. Tonight I am making up a batch of jalapeno and cheese ones. I've also done bacon and chives, blueberry, strawberry, and many others. This is the first time I made bagels and I chose your recipe. Everything seemed fine and the flavour turned out ok but what I don't understand is why flip them half way through the baking process. They were looking great and after the flip I ended up having bottom halves of bagels with no rounded tops. I think had I left them they would have turned out perfect. Any thoughts? Thanks. I'm so glad this was the first bagel recipe I have tried. I have room for an improvement, but they still tasted great. Thank you. The recipe is great, and so easy to follow. I just made bagel dogs and they turned out better than Ive ever bought from ANY box store. This dough is beautiful- so soft and supple after kneeded for the 10 minutes. I followed everything exactly except wraping the dough around the dogs and they turned out PERFECT. Very similar to my pizza dough! Tried that and it came out pretty good. I used to be GM of a bagelshop, we boiled them, but I haven't even tried them in over a decade though. Hi, I was looking on Yahoo search for my own HUB page Bagel Recipe to see where it ranked and yours was on the first search page...CONGRATS! I've tried this before and after I boil my bagels, they deflate some and get very dense and lumpy. What did I do wrong? I live in Italy and I can't find bagels here. With your recipe I can make them now!!!! Thanks a lot, they are really good and easy to make! Way to make me hungry! Mmmmmm. They look bakery quality. Nailed 'em didn't I! Now I am North London's premier bagel maker. I've already put two bagel shops out of business and I don't even sell mine. I think they're intimidated by my skills. I've even adopted a new nickname! You've got to boil your bagel! What is instant yeast? Is it rapid rise yeast? Bagels are in the oven. I coated half of them in cinnamon and sugar for the kids. Can't wait to try them. I make bagels infrequently, but will use your expert advice when I crank out my next batch. I'm assuming that your talking about the first mixing process, if this is the case, add 1/4 cup at a time and continue mixing until the dough reaches the desired consistency. How many cups of water should we add?????? No idea how many times I've used your recipe, and shared it with others, but thank you so much!! I've made several different variety's, and my favorite is adding cinnamon and dried cranberries when first mixing the dough. Again, manyyyyyyyyy thanks for the best recipe!! I made your bagels today. I used half whole wheat flour in them. They came out really great and also looked quite nice thanks to the good description! Now we have bagels in Serbia! This sounds great. I have been making bread for a little while and have perfected my 'Crusty Cloud' recipe. I am going to try your recipe today using my preferment (biga). 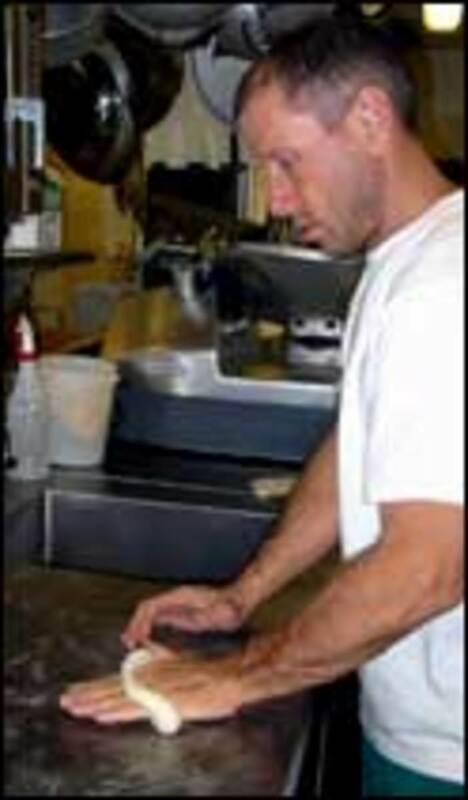 A former Montreal resident, I long for the bagels from Fairmount Bagel Factory http://www.fairmountbagel.com. I hope this comes even a little bit close. Thanks so much for the hub! Haven't had a bagel, worth eating, since moving to the country a few years back. Time for that to change! I have made these bagels three times now. Delicious and so easy. I've started making blueberry bagels by simply substituting 3/4 of a cup of dried blueberries into the mix and replacing the sugar and water with an equal volume of apple juice. I finish it off with a dash of ground cinnamon. Absolutely lovely. Excuse me while I go and polish them all off. Hi can I refrigerate the dough after the first rise and shape them the next day? Made these this past weekend. Got 8 bagels out of the batch. When all was done, they had the proper shape and consistency. Color was a little light... my reading suggests this might be because of missing lye in the water. Didn't feel adventurous enough to play with poison :) Bread flavor was a little flat. Perhaps some longer rising time for the yeasts to produce more flavor, or some different flour combinations. I'll certainly try this again and experiment more. thanks! Not quite the soft, doughy taste I was looking for. Tastes more like really good white bread. But still - very delicious. My family ate them right up. But a note - this takes more like two hours to do, at least the first time around. I never thought of making my own bagels before. Might have to try it! AMAZING!!!! So easy and tasty to boot. I laid my dough out and sprinkled cinnamon, sugar and crazins on it, then rolled up the doing and kneaded the extra stuff in. it came out amazing! thanks for the recipe. This comment is for anyone who says that this bagel tastes like pretzel. Last week was the basic halved recipe, this weekend I decided to try chocolate chip. I know, I know, not very traditional but tasty! I followed others' tips and added the 1/3C chips (2/3 for the full recipe) at the beginning. I also wanted more "bagel" flavor so substituted barley malt syrup for the sugar (equal amounts), and added 1Tbsp of the barley malt syrup, 1Tbsp baking soda and 1Tbsp salt to the boiling water. They were excellent! Just the perfect tasting, chewy bagel. Next is some toppings on a plain bagel with the water additions. I can't believe how easy this is!